The title of this blog is a bit tongue-in-cheek. I've heard this phrase from a few people along the way. The fact is, is that production is not easy, but it can be easier, hopefully, if you follow this blog and put some of the tips and tricks to practice. I will focus on Adobe Illustrator and Photoshop, with some flavoring of InDesign. On occasion, I will delve into other Adobe Creative Suite apps, and maybe a Microsoft Office tip or two. Submit your e-mail below to receive these posts by email. What is the ‘Meatball’ in Adobe Illustrator? It is what Adobe developers have christened the little circle to the right of the layer name in the Layers panel (see below). What purpose does this meatball serve? A few very handy ways of selecting and editing objects. First of all, I highly recommend working with Sub-Layers in the Layers panel. Frequently, it is a much better way of accessing objects or a group of objects in your Illustrator file than clicking directly on the object or group on the artboard. Especially if you have many complex vector objects, groups, masks and linked files. See the illustration below to see the best way to access your layers and sub-layers in Illustrator. 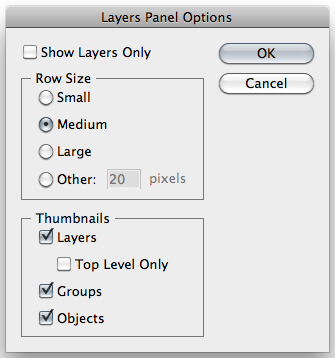 The Layer Panel Options can be accessed under the options menu in the Layers panel by selecting ‘Panel Options...’. With these options selected you will be able to reveal all layer and sub-layer contents in the Layers panel by un-collapsing the layers by clicking on the arrow to the left of the layer name. I highly recommend naming your layers and sublayers to help keep track of the primary objects or groups in your file. If you have complex graphics comprised of many smaller vector objects, you don't want to name all sub-layers. That would just be insane. So what can you do with these meatballs? Just a few simply, but handy things. Clicking on a meatball will select everything on that layer or sub-layer. What does a solid meatball mean? A solid meatball means that there is an Appearance applied to the object or group on the layer. If you need to edit the appearance, you can click on the solid meatball, then open the Appearance panel to make edits to the appearance. This is especially handy if you work with a design file you receive from another designer. Sometime you will find that you click directly on an object on the artboard to make an edit, but you can’t access part of the object. This is because there is an appearance applied to the object that is only accessible through the Appearance panel. Click the solid meatball, then open the Appearance panel to make the edits. How can you put that solid meatball to work? If you see that solid meatball and like the appearance applied to the object or group on that layer or sub-layer you can quickly put that solid meatball to work to apply its appearance to an object or group on another layer. Click on the solid meatball, then hold down the Option (Mac) or Alt (PC) key and drag the meatball to another layer. This will apply the appearance to the new layer object while keeping the appearance on the source layer. If you want to remove the appearance from the source layer and apply it to the new layer, you just drag the meatball without holding the Option or Alt key. Saving that Appearance as a Graphic Style. If you like an appearance applied to an object or group on a particular layer, click on the solid meatball on that layer or sub-layer, open the Graphic Styles window (Window > Graphic Styles), select ‘New Graphic Style...’ from the options drop down menu. Give the style a name and click OK.